Can a college basketball team’s popularity gauge how it’ll fair during March Madness? The college basketball championships are so unpredictable, that rarely can anything assure you who’s going to be the winner. But what Facebook has done is predict the winners simply based on the team’s Facebook popularity. Interestingly enough, you might want to look into Facebook’s strategy with picking brackets next year. So far, the Facebook-based bracket is off by only one or two incorrect predictions per region. Not perfect, but still better than most of us are faring so far – don’t lie, there have been plenty of upsets already. 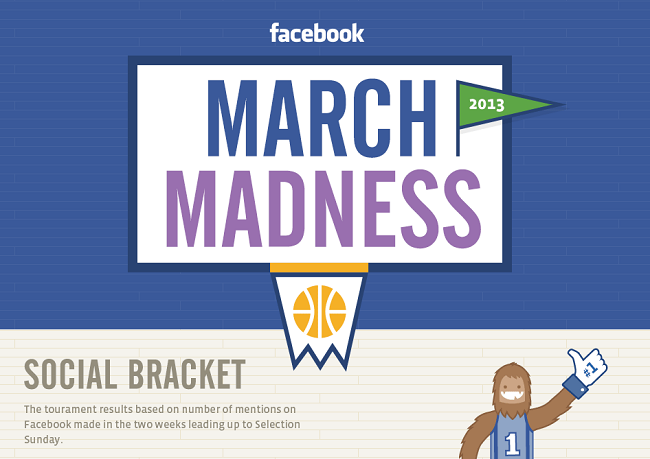 LinkedIn published its own March Madness bracket that ranked teams based on similar metrics as Facebook. LinkedIn analyzed the number of times a school’s alumni or current student said “basketball” divided by the school’s total number of students and alumni with LinkedIn profiles, and its calculations say that Gonzaga University will win it all. Good luck to them. Social media might be able to influence or predict TV ratings and maybe even stock prices, but as for whether a basketball team would win a game based on social buzz? We’re dubious. Very, very dubious.